Munich, Germany, – April 17, 2012 - Bruker Corporation (NASDAQ: BRKR) reports at the Analytica 2012 their successful launch of the HI 90 FT-MIR Spectrometer in June last year. The new Bruker Hyperspectral Imaging System HI 90 is an imaging remote chemical sensing system based on the combination of a Michelson interferometer with a focal plane array detector. Each pixel of the array records an interferogram from the corresponding field of view. A spectrum at each pixel is obtained by Fourier transformation and contains the infrared signature of the image at each point. The HI 90 system allows fast identification, quantification and visualization of potentially hazardous gases remotely from long distances. Due to its array detector, the HI 90 hyperspectral imager can measure all pixels simultaneously up to 1000 times faster than traditional scanning systems which record the spectra at each pixel sequentially. The new HI 90 represents a new ultra-high performance hyperspectral imaging system in Bruker’s broad remote sensing product line, which also consists of the Scanning Infrared Gas Imaging System SIGIS 2 for homeland security and scientific applications, the mil-spec 360 degree scanning stand-off detector RAPID, as well as the ultra-high spectral resolution FTIR spectrometer IFS 125 for scientific applications in atmospheric research. The new Hyperspectral Imaging system HI 90 has been developed for a wide range of applications. The method of infrared remote sensing allows the detection, identification, and quantification of a wide range of important organic molecules in the atmosphere. Applications of the HI 90 range from atmospheric research, environmental research and volcanology, to industrial safety and QC applications, to public safety and security applications. A major field of applications of the HI 90 system is homeland security. If hazardous compounds are released into the atmosphere, e.g. in a potential terrorist attack or during a chemical accident, then emergency response teams require rapid and precise information about the identification and location of released compounds in order to take appropriate measures to protect workers, residents and the environment. The HI 90 system allows very quick identification and visualization of such hazardous clouds from long distances of several kilometers. The image of a chemical gas cloud allows an assessment of the dimensions, dispersion and direction of travel of the released chemicals. In addition, the source of a cloud can be located in many cases. These HI 90 gas cloud imaging capabilities also lead to new possibilities in industrial safety and leak detection applications. The system identifies the released gas and the image allows to pinpoint the location of the leak, allowing accelerated repair, saving money and stopping the potential impact on the environment. In industrial safety applications, several HI 90 systems can be the basis for a network of surveillance systems, increasing safety at industrial sites with early warnings about released chemicals in case of an accident. In addition to gas sensing, the new HI 90 is perfectly suited for remote sensing of solids and liquids. 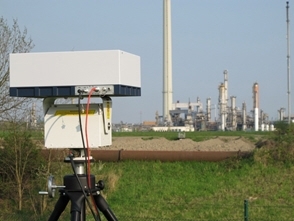 Applications range from geological and environmental applications to homeland security: liquids such as traces of chemical warfare agents on a surface may be detected and mapped using the new HI 90 hyperspectral imager.